Over the years, the Lubavitcher Rebbe, leader of the worldwide Chabad movement, spent thousands of hours teaching, inspiring, singing, dancing and uplifting. These hours were called FARBRENGEN, a central spiritual tradition in the Chassidic world. 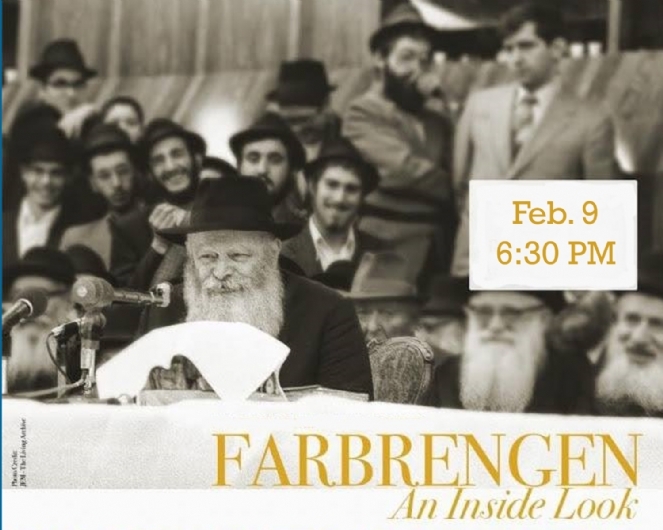 Come and experience an inner glimpse into the world of Chassidim via newly edited, rare and restored footage, of one of the thousands of Farbrengens that the Rebbe led. Narrated by Rabbi Shmuel Fuss, who personally participated in numerous farbrengens, standing just feet away from the Rebbe. Thursday, February 9th, 6:30 p.m.